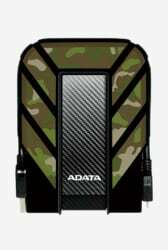 Stay connected with the digital world by opting for the ADATA HD710M 1 TB External Hard Drive that lets you store all your multimedia files and data. This easy-to-use hard drive meets the strictest IEC dust-tight requirements at IP6X that provides complete protection against ingress of dust. Moreover, the super speed USB 3.0 interface allows you to enjoy ultra-fast file transfer rates.